can oftentimes open the door to the answers for a long list of questions. What does it do? Is their proof? How is it done? Who does it? Does it really help? At the top of this article is a radio clip discussing that very episode and how Dr. Oz experienced his own spiritual revelation regarding the practice. 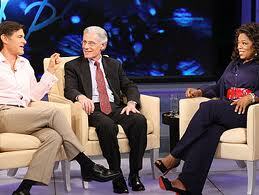 Additionally, you can check out this article [http://www.oprah.com/health/Does-Past-Life-Regression-Work] that recaps the televised discussion between the two doctors and dives into the past life regression sessions with several woman. If you were ever curious about this practice (or maybe if you are just an Oprah fan) it’s worth the few minutes of exploration. You may find that, like the women in the sessions, it is the answer to exposing and mending your own unique fears.